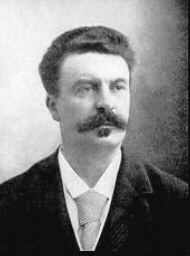 Henri René Albert Guy de Maupassant [gi də mopasɑ̃]) (August 5, 1850 – July 6, 1893) was a popular nineteenth-century French writer. He is one of the fathers of the modern short story and its leading practicioner in France. His war stories taken from the Franco-Prussian War of the 1870s denote the futility of war and the innocent civilians who get crushed in it. However, like Anton Chekhov in late nineteenth and early twentieth century Russia, his stories cover the panorama of French life at the end of the nineteenth century, including different social classes such as the peasantry, the bureaucracy and life along the Seine. His short stories are characterized by their economy of style and the efficient way in which the various threads are neatly resolved. He also wrote six novels. The Maupassants were an old Lorraine family who had settled in Normandy in the middle of the eighteenth century. In 1846 his father had married Laure Le Poittevin. With her brother Alfred, she had been the playmate of the novelist Gustave Flaubert, who was destined to have a guiding influence on her son's life. She was a woman of no common literary accomplishments, very fond of the classics, especially Shakespeare. After separating from her husband, Le Poittevin kept her two sons, the elder Guy and younger Hervé. Until he was thirteen years old Guy lived with his mother at Étretat, in the Villa des Verguies, where between the sea and the luxuriant countryside, he grew very fond of nature and outdoor sports; he went fishing with the fishermen off the coast and spoke Norman with the peasants. He was deeply devoted to his mother. As he entered junior high school, he met the great author, Gustave Flaubert. Flaubert took him under his protection and acted as a kind of literary guardian to him, guiding his debut in journalism and literature. At Flaubert's home he met Émile Zola and the Russian novelist Ivan Turgenev, as well as many of the protagonists of the realist and naturalist schools. He wrote a considerable amount of verse and a number of short plays. In 1878 he was transferred to the Ministry of Public Instruction, becoming a contributing editor to several leading newspapers such as Le Figaro, Gil Blas, Le Gaulois and l'Echo de Paris. He devoted his spare time to writing novels and short stories. In 1880 he published his first masterpiece, "Boule de Suif," which met with an instant and tremendous success. Flaubert characterized it as "a masterpiece that will endure." This was Maupassant's first piece of short fiction set during the Franco-Prussian War, and was followed by short stories such as "Deux Amis," "Mother Savage," and "Mademoiselle Fifi." His editor, Harvard, commissioned him to write new masterpieces and Maupassant continued to produce them without the slightest apparent effort. At this time he wrote what many consider to be his greatest novel, Pierre et Jean. With a natural aversion to society, he loved retirement, solitude, and meditation. He traveled extensively in Algeria, Italy, England, Brittany, Sicily, Auvergne, and from each voyage he brought back a new volume. He cruised on his private yacht "Bel-Ami," named after his earlier novel. This feverish life did not prevent him from making friends among the literary celebrities of his day: Alexandre Dumas, "fils," the son of the great novelist of the same name who was also an important writer, had a paternal affection for him; at Aix-les-Bains he met Hippolyte Taine and fell under the spell of the philosopher-historian. Flaubert continued to act as his literary godfather. His friendship with the Goncourts was of short duration; his frank and practical nature reacted against the ambience of gossip, scandal, duplicity, and invidious criticism that the two brothers had created around them in the guise of an eighteenth-century style salon. In his later years he developed an exaggerated love for solitude, a predilection for self-preservation, and a constant fear of death and mania of persecution, compounded by the syphilis he had contracted in his early days. He was pronounced insane in 1891 and died two years later, a month short of his 43rd birthday, on July 6, 1893. Maupassant is one of the fathers of the modern short story. The modern short story is not merely a condensed version of the novel, but takes on its own distinct form in the modern era. Often beginning in media res (in the middle of the action), the modern short story dispenses with much if not all of the exposition, instead choosing to reveal character not from authorial description, but from the actions of the characters themselves. Maupassant delights in clever plotting, serving as a model for W. Somerset Maugham and O. Henry. His stories about real or fake jewels ("La Parure," "Les Bijoux") are imitated with a twist by Maugham ("Mr Know-All," "A String of Beads") and Henry James ("Paste"). Taking his cue from Honore de Balzac, Maupassant wrote comfortably in both the high-Realist and fantastic modes; stories and novels such as "L'Héritage" and Bel-Ami aim to recreate Third Republic France in a realistic way, whereas many of the short stories (notably "Le Horla," cited as an inspiration for H.P. Lovecraft's "The Call of Cthulhu," and "Qui sait?") describe apparently supernatural phenomena. The supernatural in Maupassant, however, is often implicitly a symptom of the protagonists' troubled minds; Maupassant was fascinated by the burgeoning discipline of psychiatry, and attended the public lectures of Jean-Martin Charcot between 1885 and 1886 (see Pierre Bayard, Maupassant, juste avant Freud (Paris: Minuit, 1994). Charcot began his career as a neurologist, but became interested in psychology after becoming head of the hospital in Salpetriere, where he treated hysterics. De Maupassant's interest in psychology and psychopathology is expressed in his fiction. Wallace, A. H. Guy de Maupassant. Twayne Publishers, 1973. Guy de Maupassant's works Text, concordances and frequency list. History of "Guy de Maupassant"
This page was last modified on 21 July 2017, at 15:15.